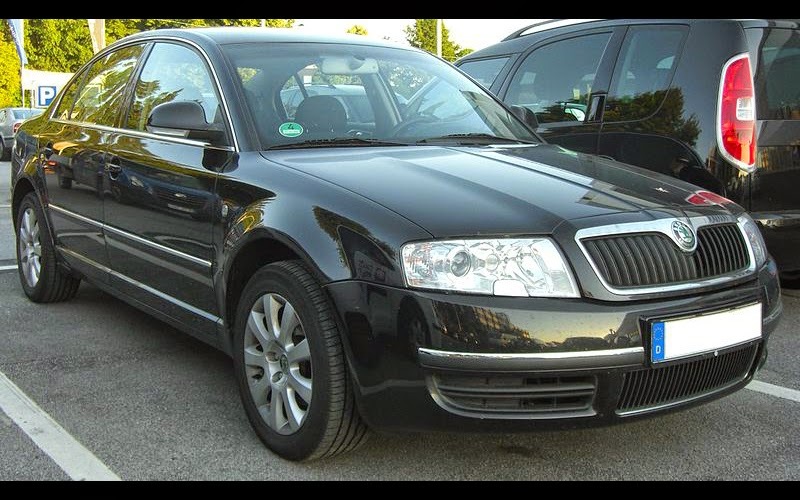 The current Škoda Superb is a large family car that has been produced by the Czech car manufacturer Škoda Auto since 2001. 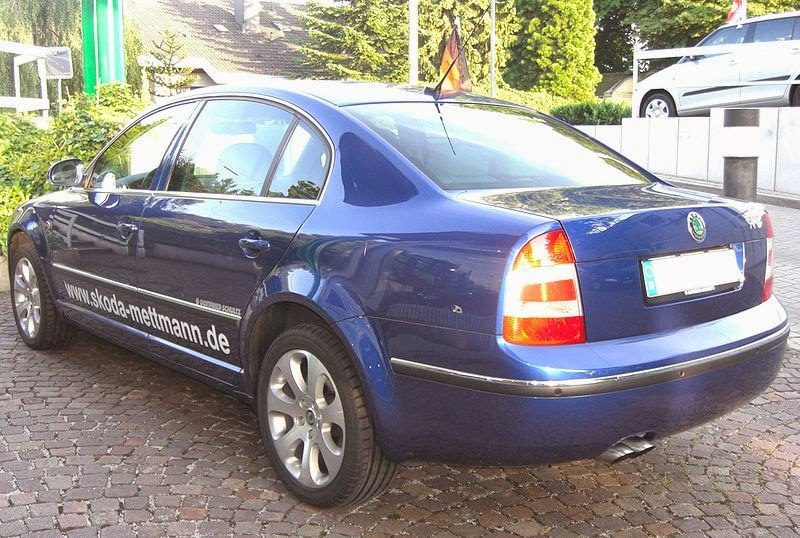 The first generation of the modern Superb, produced from 2001 to 2008, was based on the B5 platform of the Volkswagen Passat, but was elongated by 10 cm (3.9 in). 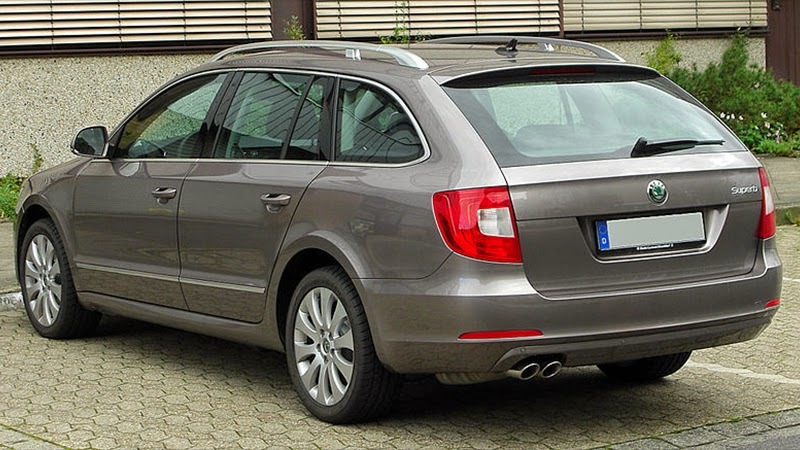 The second generation Superb used a stretched version of the PQ46 platform from the then-current Passat, and was introduced in 2008. The third, and current, generation entered production in 2015. 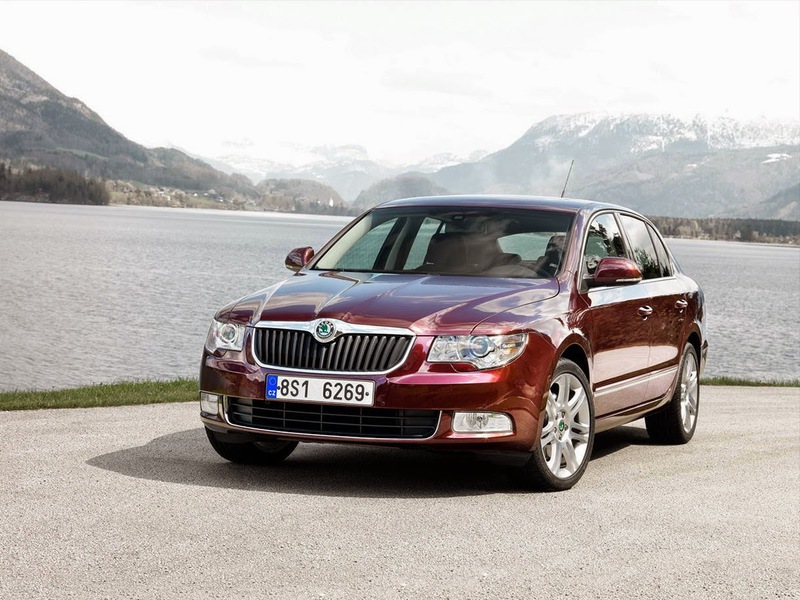 It is currently the largest and most luxurious model in Škoda's model range. The first generation of the modern Škoda Superb used the Volkswagen Group B5 PL45+ platform from the 1999 Shanghai-Volkswagen Passat B5 LWB, whose wheelbase is 10 centimetres (3.9 in) longer than the standard Passat B5. 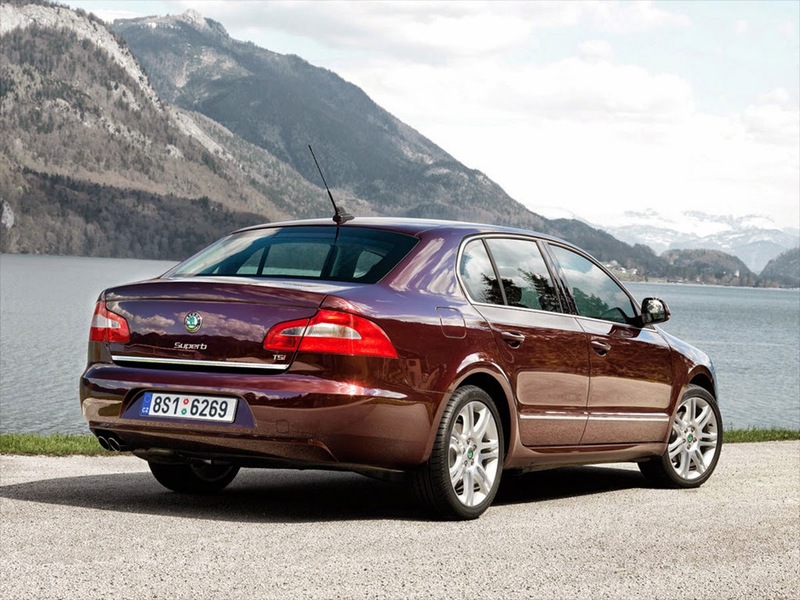 In 2005, Shanghai Volkswagen imported the Superb B5, rebadging it as the Volkswagen Passat Lingyu. In 2009, one year after Škoda Superb B5 had been discontinued in Europe, the facelifted SVW Passat Lingyu was unveiled in China. In 2011, SVW Passat Lingyu was discontinued, succeeded by SVW Passat NMS. Several petrol and diesel internal combustion engines are shared with the rest of the Volkswagen Group range; and like the B5 Passat and B6/B7 Audi A4 which use the same automobile platform, they are mounted at the front, and orientated longitudinally. The base model, the 'Classic', included the 1.9 litre inline four cylinder (I4)Turbocharged Direct Injection (TDI) turbodiesel producing 74 kilowatts (101 PS; 99 bhp), or a 2.0 litre petrol inline-four rated at 85 kW (116 PS; 114 bhp). The 'Comfort' and 'Elegance' models offered with a 1.8 20-valve Turbo petrol I4 rated at 119 kW (162 PS; 160 bhp), or either a 142 kW (193 PS; 190 bhp) V6 2.8 litre petrol engine, or a 2.5 litre V6 TDI rated at 120 kW (163 PS; 161 bhp). Transmissions included a five-speed or a six-speed manual gearbox, or a ZF-sourced five-speed tiptronic automatic. In addition to the 1.9 litre "Pumpe Düse" (PD) Unit Injector engine, the Superb eventually gained the 103 kW (140 PS; 138 bhp) 2.0 litre TDI. 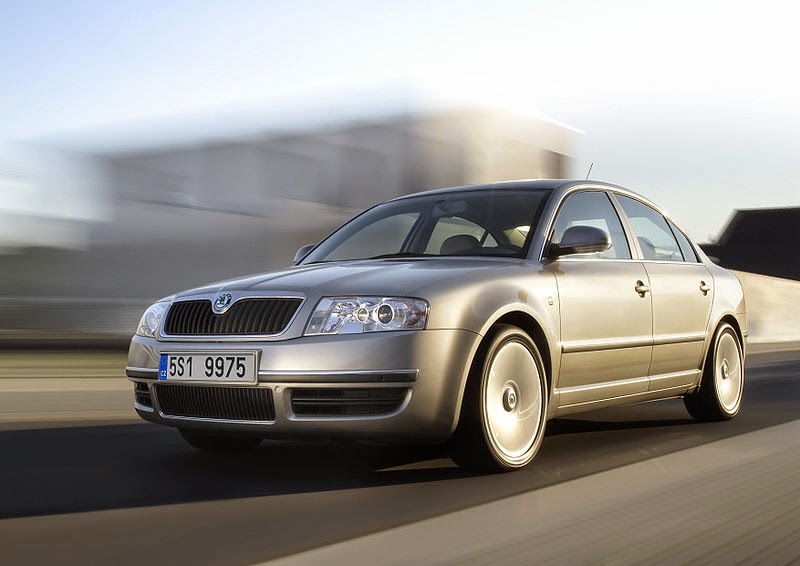 The Superb received a minor facelift in August 2006 incorporating Škoda's new radiator grille, headlights, side-repeater indicators integrated into the door mirrors, and C-shaped tail lights in the style of Škoda Roomster and latest Škoda Octavia. An interior redesign completed the upgrades. A 'Laurin and Klement' model became the top of the range, replacing the 'Elegance' model. A range of new engines was introduced and the interior featured real wood as part of some trim levels. The 'Comfort', 'Elegance' and 'Laurin & Klement' models feature an umbrella stowed in the rear door panel. Based on a stretched version of the latest A5 Octavia platform, the Volkswagen Group A6 PQ46, this Superb is a five-door five-seat liftback, with an innovative rear door that can double as a regular separate saloon boot, and full liftback, known as 'Twindoor'. Being based on the Octavia A5 platform, this Superb now utilises a transverse engine layout. A Superb Combi – five-door estate with 633 litres in the boot – was presented to the press in June 2009, and debuted at the Frankfurt Motor Show in September 2009. When launched, petrol engine options included four Volkswagen Group sourced units; consisting of an entry-level 92 kilowatts (125 PS; 123 hp) 1.4-litre inline-four cylinder (I4) TFSI (with a turbocharger and Fuel Stratified Injection), and a 118 kW (160 PS; 158 hp) 1.8-litre I4 TFSI. The flagship 3.6-litre 191 kW (260 PS; 256 hp) FSI VR6 engine (a detuned version of that fitted in the Passat R36) comes with four-wheel drive and 6-speed Direct-Shift Gearbox (DSG). The ŠKODA Superb 3,6 FSI 4x4 is currently ŠKODA's fastest production car, with a top speed 250 km/h and acceleration of 0–100 km/h in 6.5 seconds. Diesel engine options included 2.0-litre I4 Turbocharged Direct Injection (TDI) with Pumpe-Düse injection which was rated at 103 kW (140 PS; 138 hp), 2.0-litre I4 TDI 125 kW (170 PS; 168 hp) with common rail, and a 77 kW (105 PS; 103 hp) 1.9-litre I4 TDI available also for the Greenline version with reduced fuel consumption. In 2010 the engine range was updated. The car was now available with a 147 kW (200 PS; 197 hp) 2.0-litre TFSI petrol four-cylinder. Changes in diesel offer included two switches: 103 kW 2-litre with Pumpe-Düse injection was replaced with common rail engine; the 77 kW 1.9-litre PD unit was replaced with 1.6-litre common rail engine of the same power. Transmissions include five- and six-speed manual gearboxes, and the popular automatic Direct-Shift Gearbox (DSG) with either six- or seven-speeds, as an option on almost all engine/trim combinations. Add to the front-wheel drive, the Superb and Superb Combi were available with all-wheel drive with 4th-generation Haldex clutch. The wheels were choice of 16", 17" and 18". Trim levels available in the majority of Europe were named the 'Comfort', 'Ambition', 'Elegance', 'Greenline', 'Exclusive' and 'Laurin & Klement' (May 2012) – with Laurin & Klement being top of the range. In the UK market, the levels available were 'S', 'SE', 'Elegance', 'Laurin & Klement' and 'Greenline'. For the Superb was available extensive list of standard and extras, incl. bi-xenon headlamps with AFS, front/rear proximity sensors, automatic park assist system, tyre pressure monitoring system, navigation system with large 6.5” colour touch-screen display and 30 GB hard drive, TV broadcast receiver, electrically adjustable seat and mirrors, rain sensor, sunroof with solar panels that allow circulation of air in parked car, front/rear heated seats, ventilated front seats upholstered in leather. For the Superb Combi a large tilt/slide 2-piece panoramic sunroof was an option. 2009: Luxury Car of the Year in 2009 by Top Gear Magazine. 2012: In the German magazine, Auto, Motor und Sport, Superb won the first place at best cars of the 2012 survey with more than 29% votes in imported cars category. In April 2013, Škoda unveiled a facelifted Superb in Shanghai. It was released for sale in the European market in June 2013. Updated exterior design features Škoda new design language elements. Headlights are fitted with integrated LED daylight running lights; diodes are standard for tail-lights, too. The Twindoor opening mechanism was changed in order to provide easier operation: one button opens just the lid, while the other opens whole tailgate. Up to now, one button was dedicated just for opening, while the other had shifting function. With the facelift, a combination of all-wheel drive and DSG automatic transmission appeared on offer for the 125 kW 2-litre diesel engine. Starting from January 2014, design Outdoor package is available for the Superb Combi. List of feature was slightly expanded, too. Facelifted Superb received latest generation of Automatic Parking Assistant: add to parallel parking (entering/exiting the spot), the system is capable of perpendicular parking (just entering the spot). From now on, the passengers in the rear seats can adjust the passenger seat from the back. The electrical control is located on the side of the passenger seat near the centre console and is thus easy to operate from the back. Passengers in the rear can move the seat forward and back and adjust the seat height and angle. Overview of engines available for the 2nd-generation Superb (B6, Typ 3T), incl. facelifted model. The third generation Superb, (utilising the Volkswagen Group MQB platform), was announced in February 2015, with production intended to start in the middle of the year. The engine range was announced as including five petrol engines, and three diesels. Last updated on 19 February 2015 at 13:30.